Supreme Court Judge, Justice A.K. Sikri Book on Wednesday released a book titled ‘On the Rise’ by Mr. Tariq Khan, Advocate at an event held at Plenary Hall, Indian Law Institute, New Delhi. Guests of Honour were Mr. P Chidambaram and Mr. Fali S Nariman. Justice AK Sikri has praised the diligent efforts of all the stars of the book i.e. the contributors who have been brought together to contribute under one head. “We are here to uphold the rule of law and to ensure justice is done to people and their fundamental rights are protected and enforced, particularly marginalised sections of the society”, Justice Sikri said. He quoted Aharon Barak, former chief justice of Israel who said that there are two important functions of judges firstly, to uphold constitution and rule of law; and secondly, to bridge the gap between the law and the society. He also said making junior bar strong is very very important for success of our judicial and legal system. He also said that this book must be in the hands of every young lawyer who is hoping to make a mark in the legal profession. 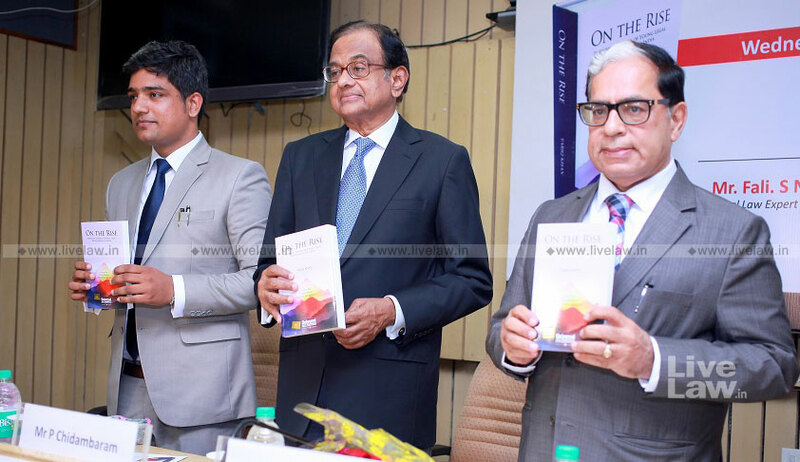 Senior Advocate P Chidambaram emphasised on the changing dynamics of the legal profession and the efforts put in by the new generation to succeed as a lawyer. He has written an elaborate Foreword in the book. He also said that lawyers must grab every opportunity to argue before the court especially an opportunity to argue a case against a senior lawyer because that is the best way to test your skills. He said young lawyers should never be intimidated with the age and experience of the lawyer on the other side. Mr.Fali S. Nariman lit up the audience’s attention with his exemplary analogies, limericks and anecdotes to quote from his personal life. He said that one must remain occupied and keep learning and undertake work even if it doesn't pay but gives experience, for value of Rupee may go down, but the same is not true for experience. He motivated the audience by saying that one must remain honest in his purpose and not in terms of paying taxes only. The best part of his speech was the reference in which he quoted speech of American Supreme Court Chief Justice, John Roberts' speech wherein he wished that life treat us unfairly to teach the value of justice. Author of the book Mr. Tariq Khan, presented his vote of thanks.